Please note the below info about the day and the co-op as that and the attachments should cover all your questions…if you have others please let me know by email. This is a FREE event. If you’re interested in joining the Co-op (you want a cob structure at your home and neighbours to help you build – please let me know) ask me questions and we can talk about your project ideas and the $20 for each project. Be Prepared: You will get dirty! Be respectful of gardens, pathways and animals at all times. This is an all ages event – everyone welcome! Parents/guardians are completely responsible for and expected to look after younger ones safety. The South End Cob Co-op continues! FREE work parties this June! After a year hiatus the South End Cob Co-op is back in full swing, and your next opportunity to get involved in cob, meet your neighbours, learn and have FUN with cob starts this June! As many of you know we started our first South End Cob project off with an oven and now we have the two attached benches to finish off! Please join us next month during the following dates to get an intro to basic foundations and cob mixes. These work parties are open to everyone (Cob Co-op member or not) and FREE – get a quick intro and task to work on at whatever stage of the benches we are at. These work party times are also a perfect opportunity for those of you who are curious about the South End Cop Co-op and haven’t yet signed up – Join us! Check out the Co-op details attached. See story in link. Also note that the building has now been leased by Island Roots Coop. 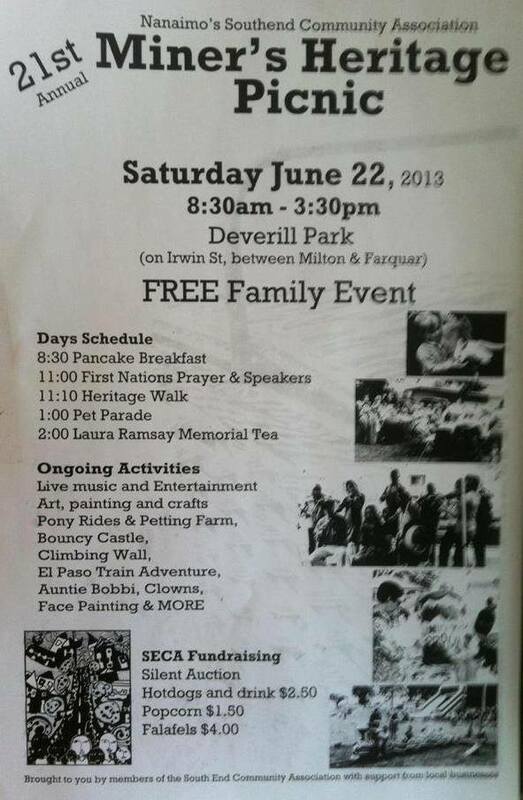 Come to the Miner’s Heritage Picnic This Saturday!